Enter the Connecticut River at Old Saybrook. Head up river approximately 10 miles and radio one of our fine Marinas for mooring or docking accomodations. 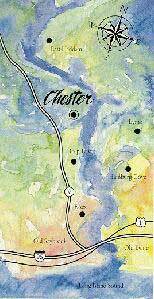 Chester has it's own airfield near the west end of town to accomodate small private aircraft. Contact the airport for more information. Take AmTrak to the Old Saybrook train Station. In the vacinity of the train station there are several car rental businesses, or you can hail a cab from Essex Taxi. Chester is about 10 miles north of the train station. From BOSTON: Take I-495 south to I-395 south to I-95 south to exit 69 for route 9 north, drive to exit 6 then make a right at bottom of exit, drive one mile to center of town. Park anywhere. From NEW YORK: Take I-95 north to exit 69 for route 9 north, drive to exit 6, at the bottom of the off ramp, make a right then drive one mile to center of town. Park anywhere. From Springfield, MA. / Hartford, CT.
Take I-91 south to route 9 south drive to exit 6, then make a left at the bottom of the exit, drive one mile to the center of town. Park anywhere. for a detailed Highway and Road Map.